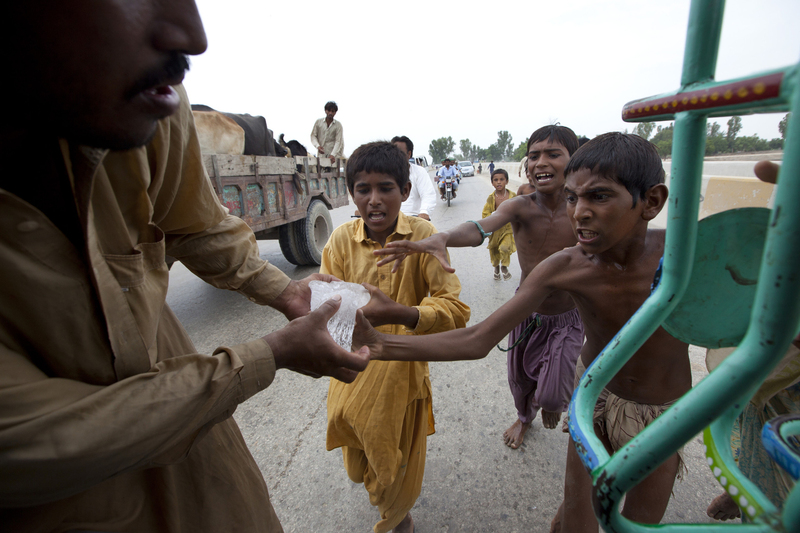 SUKKUR, PAKISTAN-AUG 15 : Desperate flood victims scramble for some ice suffering in the severe heat with a lack of clean water August 15, 2010 in Sukkur , Pakistan. The country\'s agricultural heartland has been devastated as rice, corn and wheat crops have been destroyed by the floods, officials say as many as 20 million people have been effected. Pakistan is suffering from the worst flooding in 80 years as the army and aid organizations struggle to cope with the scope of the wide spread scale of the disaster which has killed over 1,600 people and displaced millions. The U.N has described the disaster as unprecedented with over a third of the country under water.